How to backup or reset the start menu in Windows 10 | ComTek Computer Services Inc.
One of the changes of Windows 10 is a new start menu that Microsoft integrated into the operating system. Designed to please desktop users without dropping the idea of apps and features of the start screen completely, it is a balancing act that brings the old and the new together in a single interface. The core feature addition of the new start menu is that live tiles can be displayed in it now on the right side. While the left remained nearly unchanged, the right is featuring a selection of apps and their live tiles when you first boot into the system after installation or on first start. It is possible to modify the selection here. This ranges from removing all live tiles to remove them from the desktop completely to adding, moving and removing select apps from the interface. While the customization options are useful, it needs to be noted that the Windows 10 Preview does not ship with options to reset the layout or restore it. The system's reset or refresh feature may do the trick but these options have other consequences and should not be first choice because of this. The Winaero website published two methods to reset or backup the start menu layout in Windows 10. Tap on the start menu button, type cmd, hold down Ctrl and Shift, and click on cmd.exe to load an elevated command prompt. Keep that Window open and exit the Explorer shell. To do so, hold down Ctrl and Shift again, right-click the taskbar afterwards, and select Exit Explorer. This backs up the file in the backup folder on the c: drive. You can restart Explorer again now by using Ctrl-Shift-Esc to open the Task Manager, selecting File > Run New Task and typing explorer.exe there. To restore the backed up start menu again, open an elevated command prompt as outlined above and use exit explorer as well. 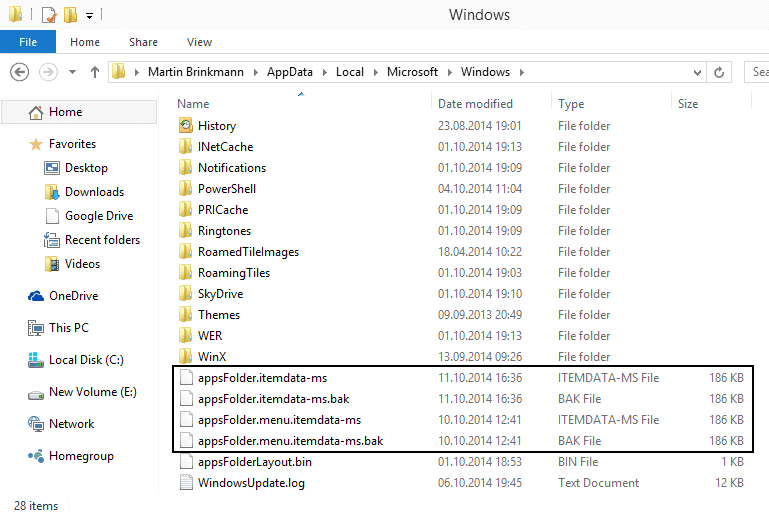 Type copy /y c:\backup\appsFolder.itemdata-ms "%LocalAppData%\Microsoft\Windows\appsFolder.itemdata-ms" afterwards to replace the current version with the backed up version. Do the following to reset the layout of the start menu in Windows 10 so that the default layout is used. Open an elevated command prompt as outlined above. Type cd /d %LocalAppData%\Microsoft\Windows\ and hit enter to switch to that directory. Exit Explorer. To do so hold down Shift and Ctrl, right-click on the Windows taskbar, and select the option from the context menu. Restart the Explorer process as outlined above.